Mike Leigh’s third feature, which opened in 1990, remains one of the celebrated director’s most admired and affecting films. 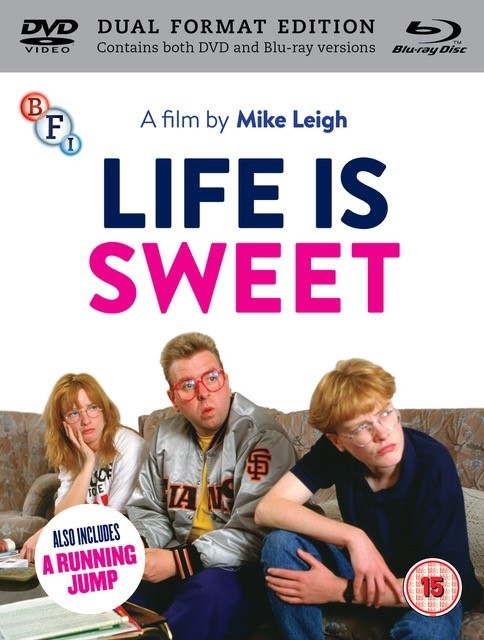 Life is Sweet depicts a summer in the life of a modern working-class family surviving in Thatcher’s Britain. This Dual Format Edition also contains the previously unreleased comedy short A Running Jump (2012) and a raft of special features unreleased in the UK, including a newly filmed interview with Jane Horrocks and an audio commentary by Mike Leigh. Andy (Jim Broadbent) is a professional chef and DIY enthusiast who buys a decrepit burger van. His wife Wendy (Alison Steadman) helps out with the launch of a Parisian-themed restaurant, The Regret Rien. One daughter, Nicola (Jane Horrocks), suffers from bulimia and is obsessed with men and Marxism, while the other, Natalie (Claire Skinner), is an apprentice plumber who dreams of escaping to America. This hilarious yet tragic domestic portrait features a dazzling ensemble performance and remains a potent, true-to-life story.